The quickest way to determine the difference between a professional local search marketing expert and someone who does not understand the process, is to watch how long it takes them to select the category or categories for your local business listing. If they complete the task in less than a few minutes, you’re working with a novice. If they follow the process I’m going to describe below, you’ve found someone who is going to put a lot of money in your pocket. Professional local search marketing experts don’t assume anything. They understand that category selection is way to important to flippantly take what is offered by Google and assume that Yahoo, Bing, InfoUSA, Localeze, UBL and others know what’s best for your business, they don’t! Selecting the right category for your business takes effort. And, when you get it right, you will dominate your market. Here’s what you need to know. There are three things you must take into account when selecting categories for your business listing. When selecting a category for your business, the first thing you want to do is determine what words and phrases you think your customers are using to find the services you offer. For example, if you own a flower shop you would start with words like: florist, flower delivery, flower shop, etc. Problem is, you’re only guessing. Next I suggest you use a keyword research tool like Market Samurai or Google to see exactly what words and phrases people are using and how often they’re using those words in their search. I would also arrange them in order of the most searched keywords first. Here are the daily searches for each keyword I found using Market Samurai. Notice how this search generated a local map. If your search does not pull up a map, discard that keyword from your consideration; it’s of no value to you in your local search marketing effort. It may still be a very good keyword, but not for this purpose. Drop it. Note: You must test each keyword in each search engine to determine if it will generate a map in that search engine. The second thing you want to consider is your competition. What categories have they selected or what categories have been selected for them? If they’ve not yet claimed their business, the search engines will select a category on their behalf. How they do this is not important nor is it appropriate for this article, what is important is the category their business is listed under. It’s also important to understand that when I use the term “competitor,” I’m not talking about your toughest, meanest most savvy competitor. I’m talking about the businesses that are listed in the top three spots for your keywords on Google, Yahoo! and Bing. Let’s go back and take a look at the florist example above. 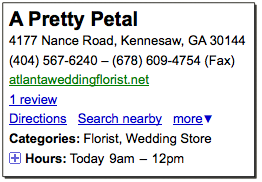 The search results show A Pretty Petal in the top spot on Google for the term “Wedding Flowers Kennesaw, GA.” If you look at their Place Page (and you can find it by clicking on the link that reads … 1 review, directions, hours, and more, you will see that they’ve selected Florist and Wedding Store as their two categories. Then look for the top three categories for the business in the second and third spot which include Marietta Florist and Gifts and Wedding Flowers by Village Green. Here are the first three categories you will find for each of the top three results. You will need to do the same research for the other highly search “keywords + community” on Google, and you will need to do the same thing when you select your categories on Yahoo! and Bing. Note: Wedding Flowers by Village Green is spamming Google by placing the keyword Wedding Flowers in front of their business name which is Village Green Flowers & Gifts. This is against Google’s rules and they are taking the risk of being removed from the search engines completely. You don’t need to spam the search engines to get high placement. Don’t take this risk. Google gives you an opportunity to select up to five categories. You must choose at least on of their suggested categories and then you can create up to four more of your own. This is best understood though an example. Let’s start by looking at the five categories Google offers for someone in the florist business. If you’re business focuses on dried, silk and/or artificial flowers, Google offers some very good category choices for you. On the other hand, if your business sells and delivers fresh cut flowers, there’s only one category that accurately describes your business; Florist. Based on my keyword and competitive research, these are the categories I would choose for my Google business listing for a florist who sells and delivers flowers. Remember, I can select up to five categories in Google and only one of them has to be a Google suggested choice. My category selections were primarily chosen in the order of the number of searches for each keyword or keyword phrase I discovered from Market Samurai. Order matters so choose your first category based on the category that generates the most business for you. You don’t have to choose Google’s suggested category first, you just need to make sure that you select one of their choices. In this example, it just happened that Florist is the most search for keyword. Yahoo! and Bing don’t give you the opportunity to create your own categories. Yahoo! allows you to select up to five categories and Bing six. Both search engines make you select from their list of standard category selections. When choosing categories for Yahoo! and Bing, I encourage you to go through the same process. Start by doing your keyword research, and then pay very close attention to the categories chosen by your competitors on those sites. They are often not the categories you expect. Selecting the most profitable categories for your business listing takes time. By doing the research you will know exactly what words and phrases the search engines promote and which words and phrases they ignore. Don’t hurry though this process. It’s to important and to valuable.